Recall Alert — September 6, 2013 – McNeil Consumer Healthcare Division of McNEIL-PPC, Inc. (“McNeil”) is voluntarily recalling at the retail level three lots, approximately 200,000 bottles, of Concentrated MOTRIN® Infants’ Drops Original Berry Flavor 1/2 fl oz bottles distributed in the United States (see full product list below). This recall is being conducted with the knowledge of the U.S. Food and Drug Administration (FDA). McNeil is asking retailers to remove the affected lots from store shelves, and is asking consumers to stop using and dispose of any product they may have that is included in this recall. After releasing these three lots of Concentrated MOTRIN® Infants’ Drops Original Berry Flavor 1/2 fl oz into the market, tiny plastic particles (approximately 1 mm in size or about the size of a poppy seed) were identified in a different product lot during manufacturing. This lot was not released to the market. It was determined that the particles originated in a shipment from a third party supplier of ibuprofen, the active ingredient in Concentrated MOTRIN® Infants’ Drops Original Berry Flavor 1/2 fl oz. Out of an abundance of caution, McNeil is voluntarily recalling the three lots released to the market made with the same batch of active ingredient. McNeil has worked with the third party to ensure that corrective measures are currently in place and are effective. The potential for adverse medical events related to the reason for this recall is not likely. 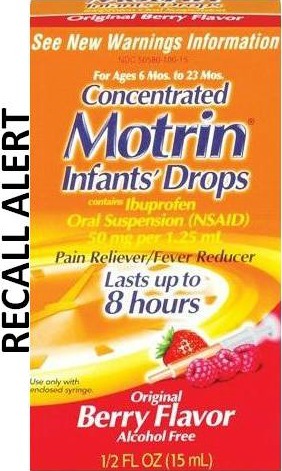 Concentrated Infants’ MOTRIN® Drops Dye-Free Berry Flavor 1 fl oz is not included in this recall. Children’s or Adult MOTRIN® products are not included in this recall. “The health and well-being of consumers is our company’s number one priority. If you have any questions or concerns, or would like to inquire about a refund, please call our Consumer Care Center,” the manufacturer wrote on its website.